Andy Murray will have to return at his best to take a step closer to his first grand slam by beating Feliciano Lopez at Wimbledon on Wednesday. After ruthlessly despatching Richard Gasquet in the last round, Murray now plays the big-serving Lopez for a place in the last four in the second match on Centre Court. The Spaniard, 29, has hit more aces than any other player in the tournament so far and he is a dangerous opponent. However, Lopez is 40 places lower in the world rankings than fourth seed Murray, so British hopes are high that he can take another step towards a historic men's singles title. Former world number four Greg Rusedski analyses where the match could be won or lost and the respective strengths and weaknesses of both players. A big serving left-hander, Lopez has been on the Tour for a long time now. The irony of him performing so well at Wimbledon is that he has a clay court specialist coach in Alberto Berasategui. The former French Open finalist has worked wonders on helping Lopez to get the mental side of his game better, as that has always been the key for him. He is such a talented player and I'm surprised he has won only two singles titles in his career because he has always had a good attacking game, a good serve, a good forehand and now mentally he has got a lot better. WHAT IS LOPEZ'S CURRENT FORM AND WIMBLEDON PEDIGREE? He got to the final in Belgrade in April on clay this year where he lost to Novak Djokovic. He then had the misfortune to run into Roger Federer in the first round at Roland Garros. This is the third time that he has reached the quarter-finals at Wimbledon, having lost to Lleyton Hewitt in 2005 and Marat Safin in 2008, which is the best he has performed at any Grand Slam. His new-found mental strength was firmly in evidence when he came back from two sets to love down in the last round against Lukasz Kubot. And his straight sets win over fellow big server Andy Roddick in the third round was superb. Andy has a phenomenal chance to win Wimbledon this year. Things are going really nicely and he has nothing to fear from Lopez. The Spaniard is coming into this match off the back of that five-set epic so he has used up a lot of energy out there and is also in action in the mixed doubles. So everything is looking very good for a semi-final place. 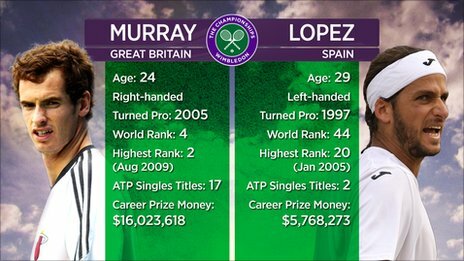 Question is, does Lopez have a big enough game to upset Murray at these championships? He is going to have to serve the best he can possibly serve. Ivan Ljubicic did that in the last round, having a first serve percentage of 70%, but still came out second best as Andy's return is his game's biggest strength. He is a left-hander and lefties are always tricky to face as they can serve out wide on the advantage court and the slice down the T, so adjusting very quickly to this is going to be key for Andy. However, the best serve for a left hander goes right into Murray's strength - his backhand return. Taking all this in, I can't really see much happening out there for Lopez because when I look at their games head-to-head, I take Murray from the back of the court, Murray on service return, Murray on the backhand, Murray on touch and feel, Murray on the forehand. 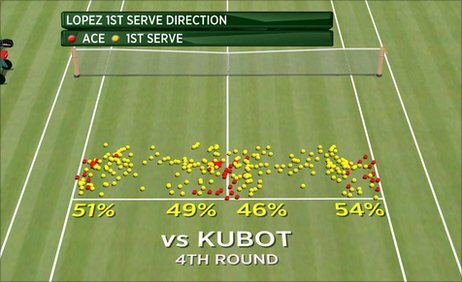 I would, though, take Lopez on his serve and his forehand down the line - an area in which Murray needs to work on. He isn't strong enough from the back of the court. His backhand, both top spin and his flat one, is a solid shot but it's not great. It can't hurt Murray, and he doesn't have the weapons to hurt Murray from the back of the court. The only way he can is if Andy serves a low percentage of first serves, which would allow Feliciano to chip and charge and come in to put the pressure on Murray. Andy has weaknesses of his own especially on his forehand as he needs to come through the ball more down the line. His habit is always to go cross court and that is where Novak Djokovic, Rafael Nadal and Roger Federer just sit on it and win the point. Currently, he kind of rotates through the ball so he comes off it ever so slightly. To change direction up the line he needs to stay on the shot longer. It is something Djokovic said he worked on hard at the end of last season, and look at the year he is having. WHAT TACTICS DOES LOPEZ NEED TO BEAT MURRAY? Lopez's way to win will be to come into the net. He is going to have to give Murray no angle when he comes in and show his variety by coming into the forehand side and down the middle of the court more often. Also, he has got to mix up his serve and not be predictable. Using the slice out wide and the one down the T into Andy's body could reap dividends, as could a change of pace. Crucially, he has to make Murray uncomfortable by holding his serve to force some tie-breaks. If he can't do that and he gets broken early it could be one-way traffic. His tactics have to be to give Murray no rhythm on the court, hope for a stinking hot day so the ball flies through the air quicker, and that the nerves get to Murray. WILL ANDY'S MUM HAVE SPLIT LOYALTIES OVER THE MAN SHE CALLS 'DELICIANO'? The only time I think she will like the look of Lopez is when Andy walks off second as the victor. Then she can enjoy the view. There will be no split loyalties as far as Judy is concerned. I think it is going to be one of those matches in which Murray will win very comfortably in three or four sets. Realistically, I can't see Lopez upsetting him. If Murray wins the first set he will win in straight sets - if not - in four. Greg Rusedski was talking to BBC Sport's Paul Birch.